With 2013 right around the corner, it’s time to gear up for a year full of optimism and good health! 1. Drink more water. Many of us may not even realize that we go through our entire day dehydrated. If you feel tired often, take a look at what you’re drinking during the day—dehydration is known to cause fatigue and muscle cramps. This coming year, make the resolution to drink more water. After all, it’s calorie-free and readily available. 2. Cut down on caffeine. Caffeine is fine for an early morning boost, but if you need a cup of joe, tea, or soda just to get your through the day, you’re training your body for dependence. In addition, too much caffeine can disrupt your sleep and lead to dehydration, so consider replacing one caffeinated beverage each day with a healthier alternative, such as water. 3. Get more beauty sleep. Make 2013 the year of feeling bright-eyed and busy-tailed by getting more sleep at night. A number of experts agree that we need seven to nine hours of sleep each night to feel adequately rested. 4. Celebrate in moderation. If you want to live a healthier lifestyle in the New Year, choose to celebrate in moderation and reduce your alcohol consumption. Not only will you help keep your liver happy, but you’ll also avoid extra calories. Try to limit your intake to no more than one drink of alcohol per day (1 drink = 12oz. of beer, 5oz. of wine or 1.5 oz. of liquor). 5. Quit smoking. We’ve written extensively about how smoking can increase your risk of breast cancer and generally wreak havoc on your health. But a new year is as good a reason as any to finally kick the habit for good. If you need help, click here to read more about tobacco quitlines. 6. Walk more. Walking is a great and easy form of exercise. Not only does it burn calories, but it helps build muscle as well. It’s also low impact and most people can do it comfortably and effortlessly. If you’re looking to improve your health in the New Year, you don’t have to walk much; only 30 minutes a day at a brisk pace will dramatically improve cardiovascular health and help maintain a healthy weight. 7. Lift weights. Make the resolution to build your body’s strength this year with moderate weight training. Not only will you help protect your bones, but you’ll also prevent the muscle loss that occurs with aging. Try lifting weights or doing resistance exercises for 20 minutes 2 to 3 times per week to keep your body healthy and active. 8. Focus on eating in moderation. Forget the diets that pervade most people’s new year. If you deprive yourself too much and remain hungry all day, you’re more likely to overindulge, particularly in the evening. Focus on moderate eating by enjoying healthy, mini-meals every few hours to keep your energy up throughout the day. 9. Cut back on the sweets. Last year, nearly 2 million people were diagnosed with diabetes. Eating too much sugar or carbohydrates floods the body with insulin in response to the spike in blood sugar. In turn, this can lead to a condition called “insulin resistance.” Over time, insulin resistance may develop into type 2 diabetes. In 2013, do your body a huge favor by cutting back the sweets and increasing fiber to prevent insulin resistance and diabetes. 10. Take vitamins. Ask your doctor what nutrients you may be missing and how you may benefit from nutritional supplements. For example, if you’re a vegetarian, it’s important to make sure you get plenty of vitamin B12. You may find a daily multivitamin can help fill in the nutritional gaps within your diet. 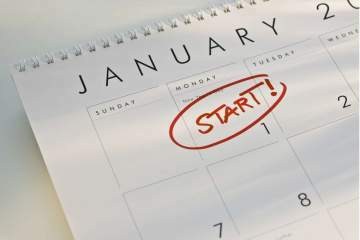 What are your New Year’s resolutions for 2013? Share your aspirations in the comments section below!